We are delighted to be holding our first ever Virtual 5K, the jogscotland 5k Wellbeing Run! Sign up to walk, jog or run 5K in your own time, and reward yourself with one of our amazing medals, featuring our mascot Jog Scotty! How do I take sign up? Just visit our online entry page. Can we register as a group or as a team? Yes, our entry system will allow you to enter as an individual, or as a team of 5 or 10. For team entries only one set of main contact details will be required and medals will be sent to that contact in bulk. Can I complete the 5K in stages? Absolutely! Your distance can be done over different days and times. It’s up to you, just keep a record so that you know when you’ve reached your target. What do I do when I have completed my 5K? Post a photo or a selfie to social media when you complete your challenge (or if you’re really shy, an image from your running app or GPS!). Use the hashtag #jogscotland5k and tag jogscotland’s twitter, or Instagram accounts, or post it on our facebook page. We’ll then share some of the images posted on our social media channels and in Stride magazine to inspire others to take part! I don’t use social media. Can I send my photo to somewhere else? Yes, please send it to us by email at jogscotland@scottishathletics.org.uk. Feel free to include any information you like along with your picture, and let us know if you’re happy for it to be used on social media, on our website, and/or in Stride magazine. I’ve done my 5K. When will I receive my medal? Medals will be posted out approximately 4 weeks after you signed up to take part. What if I don’t complete the 5K within 4 weeks? Not a problem – we know life sometimes gets in the way, and we trust you! 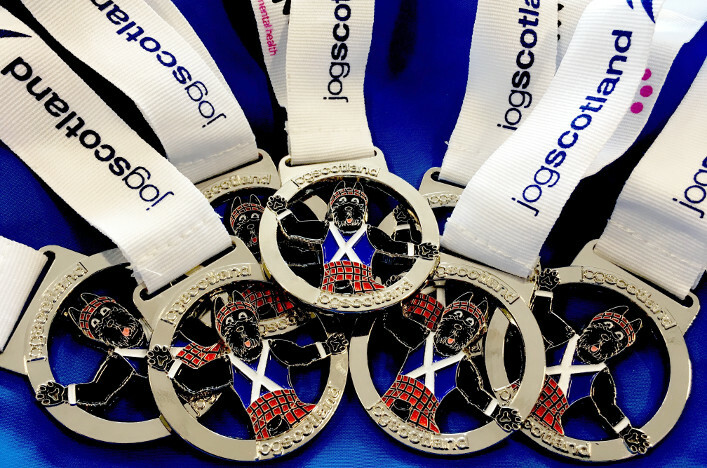 The support you’ve shown jogscotland means a lot to us so you will be sent your medal even if you don’t complete the challenge within 4 weeks – but don’t forget to do it! We’ll look forward to seeing your completion picture on social media in due course! How much is it, and what happens to the money? The entry fee is £12.99 and all money raised will be ploughed back into jogscotland‘s work, helping more people improve their physical and mental health by getting active, and supporting the jog leaders who make it all happen. I’ve registered but I don’t want to take part anymore. Can I have a refund? Yes, please contact our finance department to arrange this and provide proof of the payment that you made. Email finance@scottishathletics.org.uk. It’s OK – just skip this question and continue to page 2. (This question is included as standard on our entry system for people who are entering scottishathletics events like the scottishathletics national championships. All the clubs listed are athletics clubs rather than jog groups). Your online entry system doesn’t let me register as non-binary – how do I take part? Apologies that our entry system currently doesn’t have a non-binary option – we’re designing a new one that will do this, but it’s not ready yet. In the meantime, we’d really love you to take part. Just use this form and email it to jogscotland@scottishathletics.org.uk. Then give us a call on 0131 539 7341 during office hours to make your payment – have your card ready. Can you post my medal overseas? Unfortunately not, we can only post to UK addresses.